A team of four comedy performers thrust together as part of their community service. 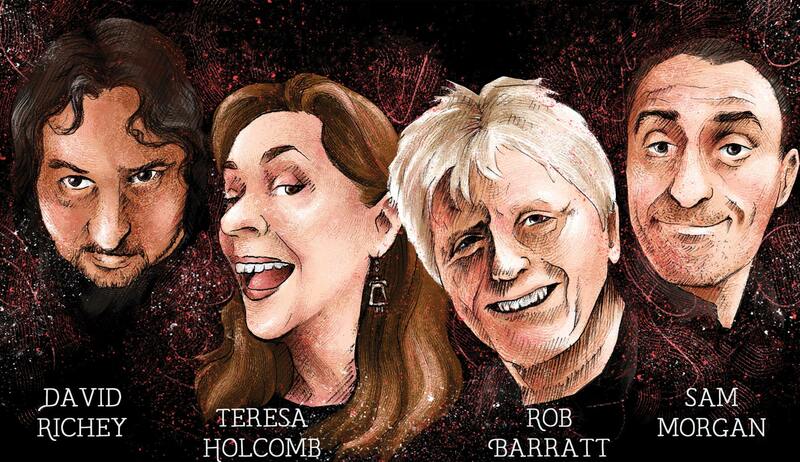 Guaranteed to entertain, delight and horrify, Sweet ‘n’ Sour is a comedy improvisation group consisting of four top comedy performers from varying disciplines who combine their skills to create spontaneous humour of the very best. Through a series of games, not unlike the TV show Whose Line Is It Anyway?, they incorporate audience suggestions into an array of scenes that range from high-end humorous to the blatantly absurd. David Richey spent much of his childhood with his ear glued to the radio. Eventually, thanks to an industrial solvent and a friend called Ian, he had it removed. But not before he had heard enough to make him fall in love with the magic of both music and the humour of the spoken word. Dave co-founded The House of Fun Theatre with his wife Rachael. Now in its eighteenth year, it keeps him very busy. And when he’s not performing he’s travelling around the country teaching theatre skills to others. Sam Morgan is a professional actor, comedy writer and character comedian. he trained at Chicago IO (improvisation), London and Bristol. Since 2011, he’s both directed and performed with the improve comedy group Improperly. Sam is also one half of Sam and Dave, a sketch comedy double-act which has performed to great acclaim in the South West for over six years, and was lead writer and actor for BBC Radio Devon’s A Comic Review of the Year 2011. His credits include The Comic Strip Presents, Red Top and The Hunt for Tony Blair, BBC Radio plays, numerous TV commercials, a series of award-winning short films and extensive theatre experience. He has worked with a lot of famous people, but chooses not to drop names as he wants to work with them again one day! Teresa Holcomb has been doing comedy for way too long — frankly she should be much funnier by now. An American in Cornwall, she regales tales from her past and her homeland, weaving this into clever quips concerning her move to Great Britain, her ideas on what’s different and why. Teresa began her career in stand-up in the US and, after relocating to the UK, worked the circuit before deciding not to continue on the major scene, but looked to her own back garden for fun. She put together Sweet ‘n’ Sour in 2014, pulling from friends and colleagues alike, and really enjoys both directing and playing along with these silly, irreverent, goofy and talented people. Rob Barratt is a Dudley-born and Cornwall-based comic poet and singer, and now improv actor, who combines clever word play, verse and song with satire, parody and audience participation. Ex-teacher Rob deals with such important topics as squid, the weather in Scotland, distressed furniture and tuk-tuks. In recent years Rob has appeared at folk, literature and arts festivals all over the UK and in Australia. Mike Harding said of Rob, “He is not only clever but … he’s very funny”.